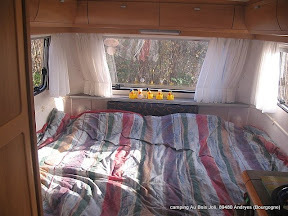 Our ‘Mollycoddle’ between the rentals at ‘Au Bois Joli’ is the caravan Eriba, type Troll GL. This caravan is only adapted for two adults. 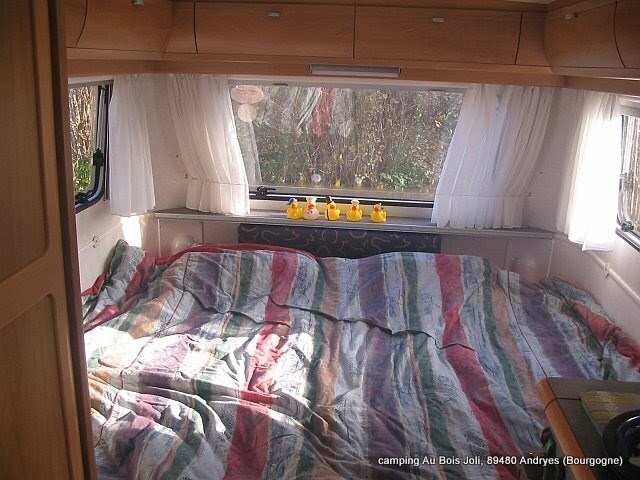 Do you want to camp and enjoy your holidays on a campsite, but you don’t like a long trip with a caravan behind your car? Than our Eriba is very suitable for you! 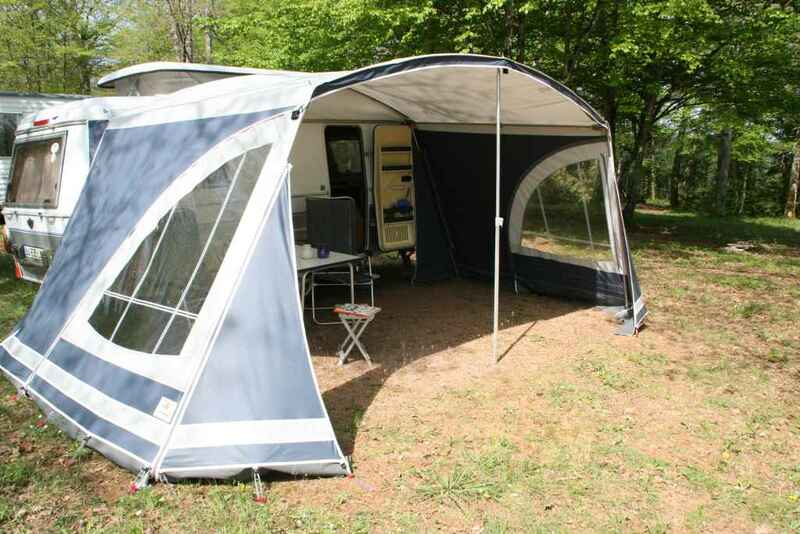 The caravan has an omnistore, parasol and all the other things of comfortableness that you need for luxuary campsite-holidays. The end of stay cleaning and Ecoparticipation are included. Our caravan Eriba is equipped luxury. There is a fixed bed, that you’ll find maked completely at your arrival. There is a complete kitchen equipment (watch inventory list), but also a ‘skottelbraai’ and an additional gas-cooker, so you can preprare your meals outside when the weather is fine. The bed has clean washed mattras canvas and two anti-allergic featherbeds. 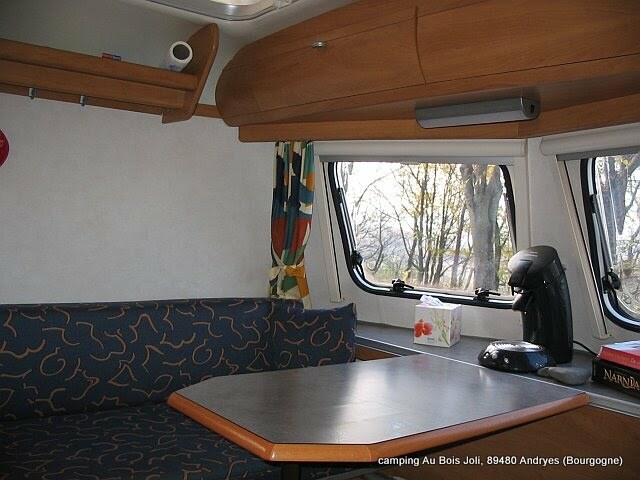 There is also a camping-table and two luxury adjustable camping-chairs. The caravan has a gas heater, but is also very good isolated, so it will give you a lot of comfort during the whole season. At you rarrival there is a complete set of towels ready for you, that we’ll refresh twice a week. When you stay more than a week, the bed linen will be refreshed every week also. The caravan is no smoking, dogs or other animals are not allowed. Due to hygienic reasons you are asked to provide your own pillows, the rest will be ready for you. 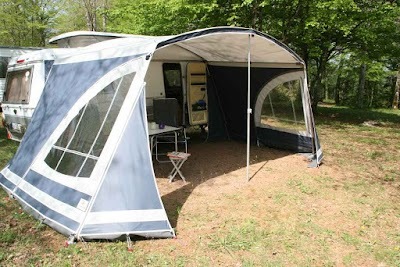 Therefore you can fully enjoy your luxury camping-holidays, if you imagine you’re in your own little-hotel! The full rental price must be paid 4 weeks before arrival. If you have to leave early, we can not give any restitution of rent. You are free to take out a cancellation insurance yourself. A deposit of €200, – must be given on arrival. This will be restored at the end of the stay. Damaged or missing equipment or when we’ll need extra time to clean up the tent after your visit, will be deducted from it depending on the repairing costs. The reservation fee is € 12,50 for each reservation.